If you need to bill your customer for a job that's still in progress, Kickserv does not yet support this out of the box, but here are 2 ways you can accomplish it. Read on. Add all the charges to the job. This will reflect the grand total once the job is complete. Click the green Generate Invoice button in the upper right. Print or email the invoice to the customer for their records. Collect the first payment or deposit from the customer. Under the Payments section of the invoice, select Log a payment. Enter the payment details. Make a note in the payment notes text box that the project is billed in phases. Continue with the next phase of the job, and again print or email the invoice that will now show the customer has partially paid. You will need to instruct your customer on what the next payment amount should be. You can write this in the body of the email. Repeat until the job is complete and the balance owed is $0. This option is popular with some Kickserv users. As in the first step of Option 1 above, create a single "master job" and add all charges to it. This job will be used for reference only, during estimation and planning. Next, create a separate "Phase 1" job and schedule event(s) for the first part of the work. Add only the work that will be done and/or charged in this first phase. Once the work is done or payment is required, generate the invoice for Phase 1. Deliver the invoice to your customer via email (or printed hard copy), explaining in that this is the invoice for Phase 1 only. Collect payment. 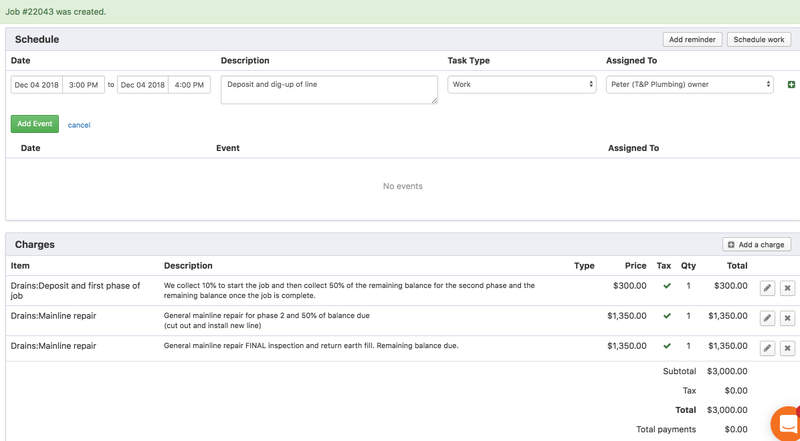 Once the payment is logged, mark the job and its event complete to keep your schedule tidy. Move on to Phase 2. Create a new job for the customer and schedule the work event for the second phase of work. Repeat the preceding steps and collect payment for Phase 2. Repeat as necessary for each phase of the work. The "master job" can be kept around for reference or deleted when desired. You can drag your line charges up and down so they are in the order you will bill them. Once the first phase is completed and collected add the total to the second line or second phase of the job.